Believers Bookshelf - Satan and how he works! Make no mistake about it - Satan is a real personality. He is also a positive enemy against God, all His purposes, His activities and His people. The name Satan means "adversary," and Devil means "accuser." He is called "the prince of demons" in Matt. 12:24. In Revelation 12:9-10 our adversary is labeled "the great dragon," "that old serpent, called the Devil, and Satan, which deceiveth the whole world." He is also designated there as "the accuser of our brethren," accusing them before God day and night. The name "great dragon" would speak of his power politically as world ruler and "prince of the power of the air" (Eph. 2:2). "That old serpent" speaks of his power spiritually as the deceiver of the whole world and "god of this age who blinds the minds of those who believe not" (2 Cor. 4:4). Satan is the same old serpent who came in the Garden of Eden and deceived Eve and led her and Adam into disobedience and sin against God. Eve had to afterwards say, The serpent beguiled (or deceived) me" (Gen. 3:13). ·	What are his main activities? ·	How does the devil tempt us today? ·	What is our best defense against him? ·	Can a believer be demon-possessed? ·	What is his goal in the world? ·	Is he already a defeated foe? 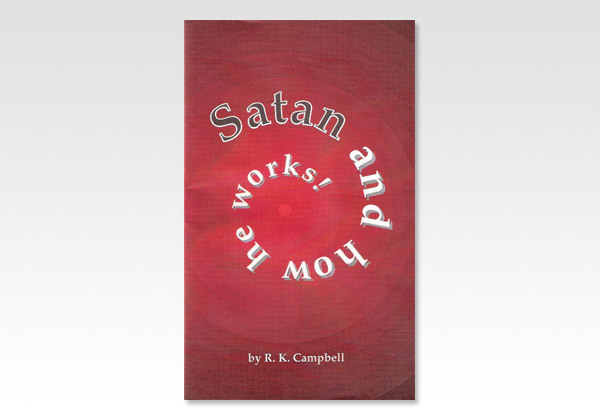 SATAN And How He Works was written by R. K. Campbell to help give scriptural answers to these and other questions about this great deceiver.